Two weeks ago I shared a hot air balloon birthday card I made. However, sometimes when you're busy and don't have time to punch or stamp, a great paper pad and accessories is just the answer! Today's card is made with the new Echo Park Just Be You 6 x 6 paper pad and pieces from the matching ephemera pack. I added a couple coordinating papers from my stash and I had a card! 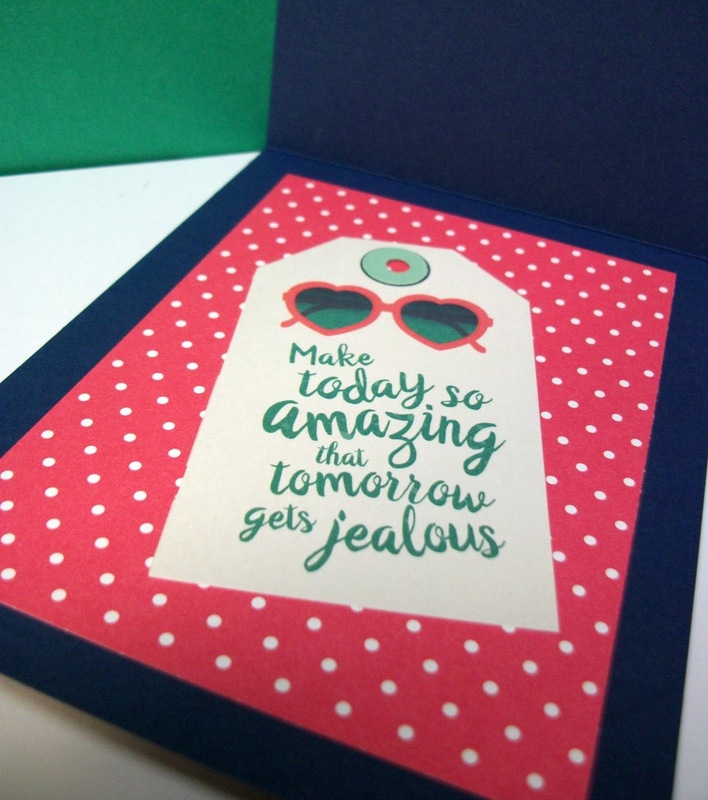 The card base is 4-1/4 x 5-1/2" cut from navy cardstock, top folding. 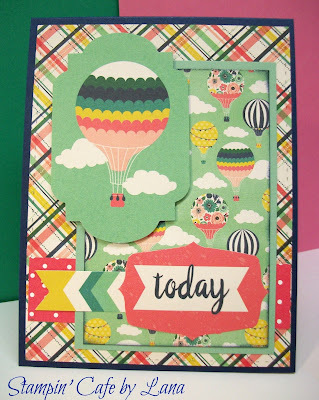 The plaid layer is 4 x 5-1/2" and is die cut using the Bundle of Stitched Shapes from Simon Says Stamp. 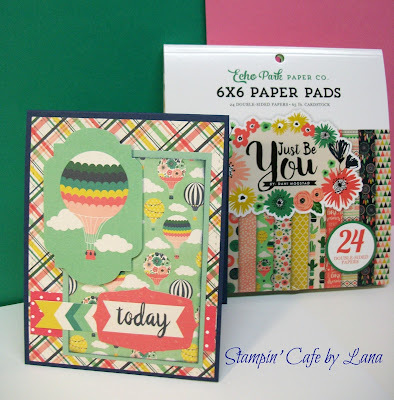 I chose the balloon paper from the paper pad, cut to 2-3/4 x 4-1/4". I layered this on top of a piece of mint macaron cardstock from Stampin' Up, cut at 3 x 4-1/2" that matched the patterned paper very well! The only ink I used on this card was applying some navy ink to the edges of the balloon paper piece before attaching it to the mint cardstock. 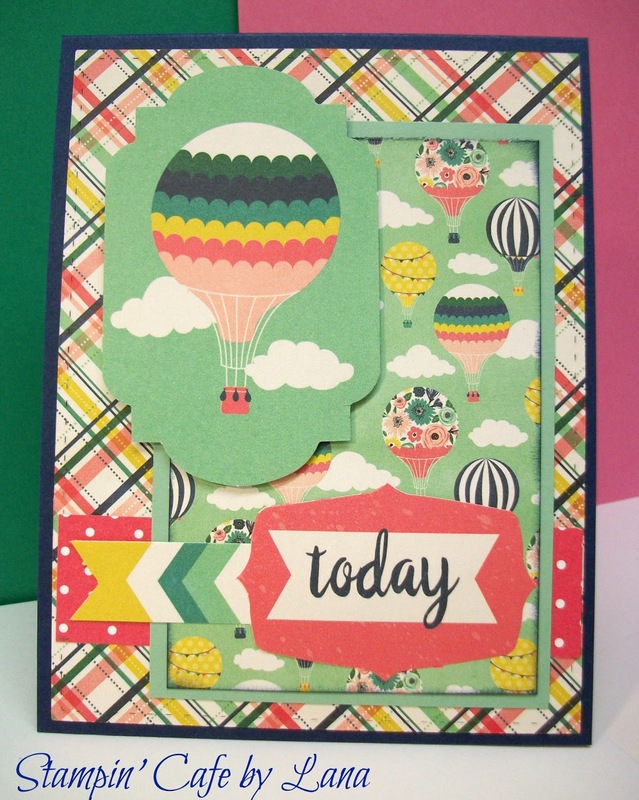 I used other pieces from the ephemera pack on the front of the card, a striped flag, the "today" sentiment piece, and of course the darling hot air balloon piece. I had some pink polka dot paper from my stash that also matched the plaid paper, so I used a 1 inch strip along the bottom portion of the card as an accent and then cut another piece 3-1/2 x 4-3/4" for the inside of the card. As you can see from the photo, I used one of the tags from the ephemera pack for the inside sentiment. I plan to use this for a birthday card, but it could be for other occasions as well, or just a pick-me-up card. I aboslutely love this Just Be You paper collection from Echo Park and plan to get more coordinating pieces from the collection! The paper is very high quality, cardstock thickness, and double sided! You can't beat that! NOTE: I ordered my Echo Park - Just Be You paper pad and ephemera pack from Amazon and chose a seller that offered free shipping, but I also found the collection on Scrapbook.com.